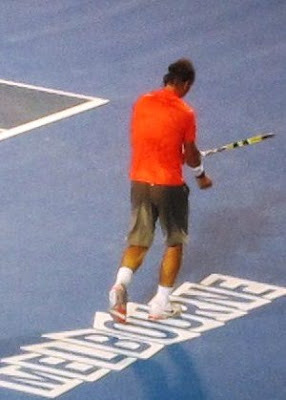 The Australian Open Tennis Tournament 2011 in Melbourne on 22 January. And it played out like this. he his tennis is something else to watch. As you can see by the first photo he was ringing wet after the first set and had to change his shirt much to the bitter disappointment of the crowd. It went a bit wild. Asked how he felt when women whistled and took photos of him changing his shirt, Nadal flashed his trademark smile and said: "That's a very good feeling." I guess as the new face of the Georgio Armani Spring/Summer collection he is getting used to the attention. I know he won the game ...and I can tell you exactly how many times he changed his shirt but I just cannot recall who he was playing against or what the actual score was. Winner of the CSN Online Voucher is Aleta - you can check her blog, Fleur de Aleta out here. I used Random.org to draw the winner. Happy shopping! LOL. His opponent's name is neither here, nor there. my daughter's a big fan of Nadal. I love the way he dresses (or undresses) lol. he probably could sell that towel. Is he an Aussie? 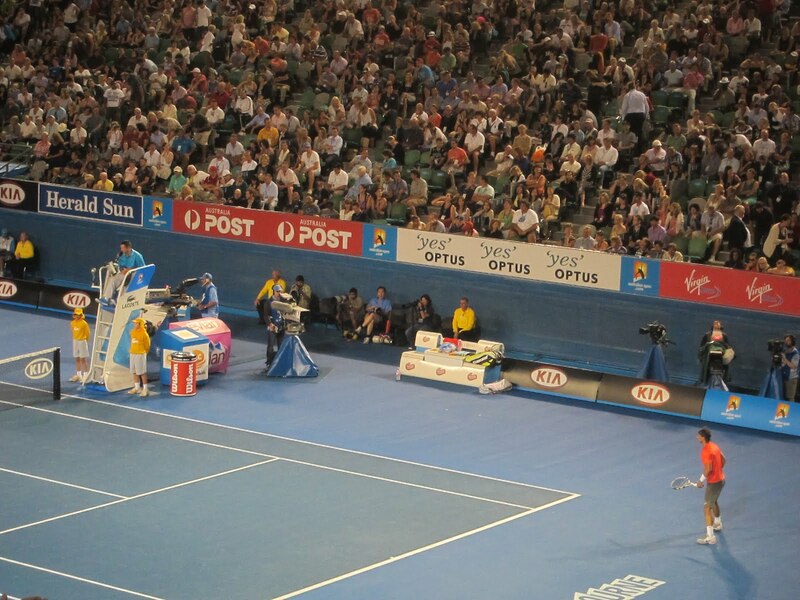 So you are dreaming of his backhand? I used to love to watch Greg Louganis dive. and those speedos... oh my! @ Lisleman - he is Spanish and they do often throw their towels to people in the crowds. No dont think I would want it though. These guys must be so fit to stay out there in that blistering sun for hours and hours hitting a tennis ball. They make it look easy but it cant be. @ Joanie - yes I remember him. Was he the one that hit his head or am I thinking about someone else. I honestly do not follow any sports, except I occassionally watch Golf here on TV....But I cannot pick out any one player that is as HOT as this guy!!! I am going to post my next MOVIE thingy a little later this A.M. and "RABBIT HOLE" is covered...! Yes I have my favourites that would be any of those 6ft tall blonde Russian tennis players. Talk about fine sportswomen! Nadal I believe is one of the best tennis players ever. Hi Lilly! Long time no see! I'm so bad about getting around to everyone's blogs these days...but here I am getting caught up! I think any sports stars are worth watching. Preferably from the couch. Amazing athletes. "OFF TOPIC"!!!! This one-finger typing has it's difficulties...lol! Oh and he is out injured now. Wonder who will win now? Check out the very last 5 minutes of soccer matches- they swap T-shirts!!! I realzed this only a year ago. So much i missed. Ha ha that is funny Judit! You are so right. Nice pictures ;) One of my friends told me that the only reason she watches Football is because of the tight clothing on the men! Lol. I'm so thrilled about the win - Thank you! I received the items that I ordered in the mail this week - Woot! I'm sure what you said was very interesting but I lost track on the shirtless picture... :p Great post, first visit and not the last! I watched this match during a cross country flight! Hot, yes! I devour tennis, baseball, golf and football .... watch as often as my schedule allows. I saw Andre Agassi live years ago, be still my heart. Hope life is treating you well, Ms. Lilly! Do you think you blog like Forrest Gump? It's been such a long time since you posted, dear Lilly...I hope you are alright and just very very busy...! Sending Hugs from Hollywood! Hello Lilly, Hope all is well. I'm still on the road, and loving life. Thanks for stopping by and checking on me.